The first-ever instructional deck of cards designed by professional coaches for youth coaches. Shuffle through 52 color-coded drills that teach valuable fundamentals while leaving in the fun. These drills are created for any level of coach to work with players 6-16. Cut down on some of the time you spend developing practice plans and put energy in coaching the key areas of the game with these fun, team active drills. Make your practices extremely effective and watch as your players confidence and skills grow. Combine drills and use the "Make it a Game" feature that will make your players hungry for more. 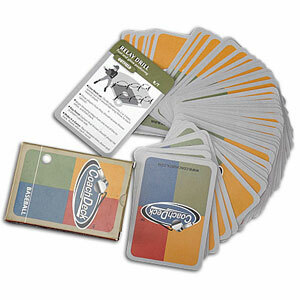 A perfect practice is in the cards with Coachdeck Baseball Drills.